At Myriad, we believe in helping patients and their families to learn more about disease and how genetic testing can improve their understanding of risk factors, diagnosis, survival and treatment options. Providing accurate, up-to-date information and support is part of our commitment to patients. In addition to sharing real patient stories and information on patient support groups, we have a website dedicated to helping patients find comprehensive information about hereditary cancer syndromes – what they are, what the risks are and what patients can do. We have also developed several tools to help patients determine whether they should be evaluated for a hereditary cancer syndrome. Myriad also invites patients and their families to join the conversation on Facebook or Twitter. 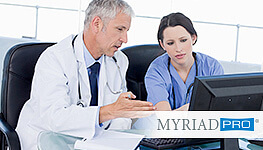 MyriadPro is the hub for all Myriad-related information for healthcare professionals. Order Myriad test kits for your patients’ and/or practice – for healthcare professionals only.